We LOVE Heirloom Audio Productions! So you can imagine my sheer delight to find out I was chosen to review The Dragon and the Raven, the newest release by Heirloom Audio Productions. 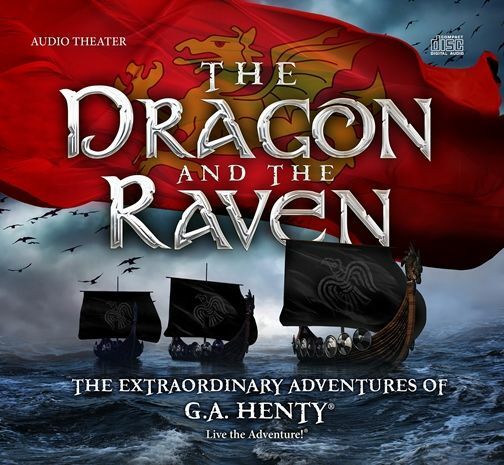 Like other audio dramas I've reviewed from Heirloom Audio Productions, The Dragon and the Raven is based off the work of G.A. Henty. An audio drama is so much more than an audio book. It's a theatrical production that you listen to instead of watch. The ambient sounds and acting is amazing and real. You don't just hear someone reading a story, instead you are listening to them act it out. You can hear birds singing in the background, the clash of weapons, the splashing of water. Who needs pictures when the sounds alone transport you to another world?! The Dragon and the Raven take us back to the days of King Alfred and the Danes of the 9th century. Europe is under attack by the Vikings. They are decimating everything in their path, taking control of lands and people. King Alfred proves to be a master strategist at his young age, while he successfully defeats the Danes unlike anyone else. With the help of Edmund and Harold (Harold...just Harold) we get to take part in a grand adventure! For this review we received a physical 2 CD set with over 2 hours of listening fun, the complete eStudy Guide and Discussion Starter, a lovely printable copy of Proverbs 21:31, a full mp3 soundtrack of the music (AMAZING MUSIC,) a behind the scenes documentary on the making of The Dragon and the Raven, a graphic eBook of Henty's work that this is based on, newsletter, and a printable poster. We are on the go a lot. In addition to our regular errands, 3 days a week Mr. B and I make a 75 minute trip to pick up his little sister (courtesy of his dad and step-mom) from school. We always arrive at her school very early. This provided ample time to listen to The Dragon and the Raven in the car. One thing that has amazed me since our first review for Heirloom Audio Productions, "In Freedom's Cause" has been the super calming effect these audio dramas have on Mr. B. He can be stimming or in super hyper mode, and within just minutes he is calm, listening intently to what is going on in the drama. I thought maybe the calm was just a fluke, then we reviewed "With Lee in Virginia." Definitely not just a fluke! The Dragon and the Raven was no exception. This was a great tool to keep him entertained while we waited. We laughed, we talked, we loved it! I used the study guide and discussion starters as writing prompts and art ideas. Sometimes I would use them as ideas for him to narrate answers to me, I'd write them out in cursive, then have him trace the cursive to work on copywork skills. As for the printable verse: January 20 was the 17th anniversary of my dad's death due to cancer. He LOVED horses, and we raised them. So this was a gift to my mom in memory of my dad and his battle with cancer. We love it! Heirloom Audio Production has another home run winner with The Dragon and the Raven. It's a fantastic production that we have already listened to multiple times. We get in the car, and Mr. B will ask to listen to it. That alone screams volumes of just how much we love this product! Some may say they aren't into audio books, and that's ok! But this is NOT an audio book. It's an audio drama that will take you on an amazing adventure! To read more, please click below to be whisked away to the Schoolhouse Review Crew!